You are here: Home / Surveying / Micro-drilling construction timbers. How and why it works. Wet Rot. Dry Rot, beetle infestations. All real problems in construction timbers. In most cases diagnosis and estimation of the extent of the problem is easy; a torch and a screwdriver being all the tools needed, by any half-decent timber infestation surveyor. However, when large section timbers, valuable historic members or restricted access is concerned, problems arise. These can cost money if mistakes are made. For example; the bearings of large trusses may have sound visible section, whilst decay within the bearing has extended down the end grain, in a cone of weakness, often invisible from the surface. Death watch beetle Xestobium rufovillosum, is able to complete its long lifecycle within voids and shakes in such timbers – leading to substantial loss of section and continuing infestation, even after surface treatment. Knowing the condition of timber in depth, is essential, before treatments are considered. Clients like micro-drilling too; there’s nothing more costly than placing an order for the end of beam to be repaired by scarf joint or resin re-enforcement, only to find that when the contractor cuts back the timber, he finds that a much more extensive section is needed – quotes can suddenly triple during the work; breaking tight budgets, after orders have been placed. There are a few instruments available for the work; resistor-graphs, drill augers and the like. 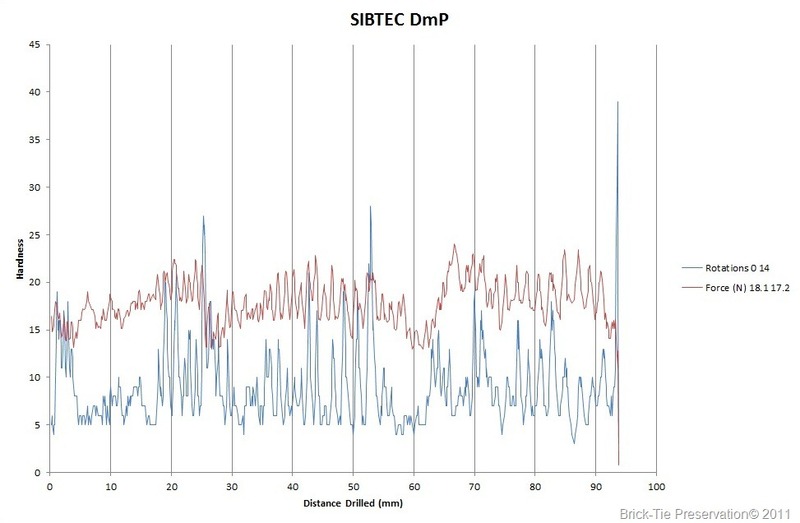 However, Sib Tec’s Digital Micro-probe is the class leading machine for this job. 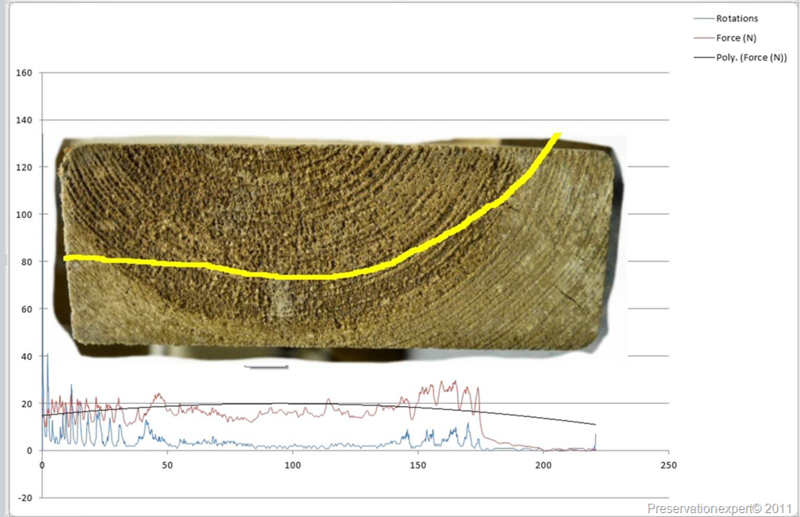 Not only identifying the condition of timber up to 1m deep, but also recording the data digitally for import and analysis via spread sheet and custom software. 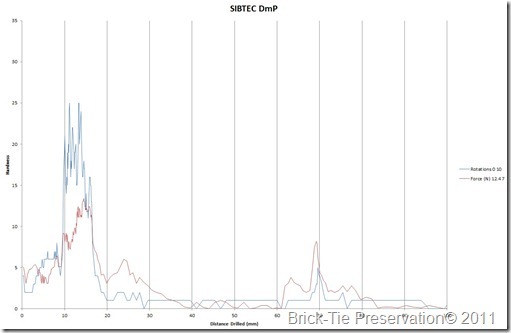 The Sib Tec Dmp uses measurement of applied force and the 7000rpm rotations of its1mm probe, to calculate the hardness of the timber. This is recorded for every 0.1mm of depth. As any surveyor will attest, timber is remarkably variable, not only species to species but also, from spring to summer growth, sapwood to heartwood and in tangential, longitudinal and radial directions. As a result, the Dmp is not a tool for a general surveyor. A timber specialist is needed to decide on the number, depth and orientation of the probe positions. He then needs to be able to interpret the data, which is really the where the most skill comes in. 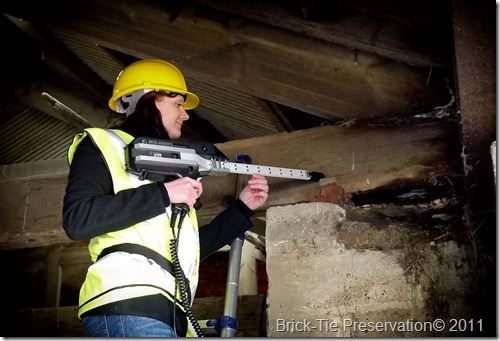 For example, last week I was asked to check the condition of 16 large queen post trusses in a Yorkshire barn complex, due to be converted. The beams are actually softwood, rather than the more common oak we tend to find in older barns. There was some obvious decay in some bearings, but how was the engineer to specify the cut-back and repair with confidence? This timber was much softer than oak and the spring growth, if probed tangentially, was not much harder than part rotted hardwood. 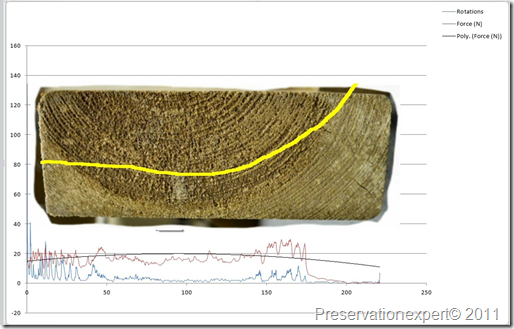 A great deal of care was needed, to orientate the probe, note the nature of the converted timber before drilling and check the data, with these notes to hand. 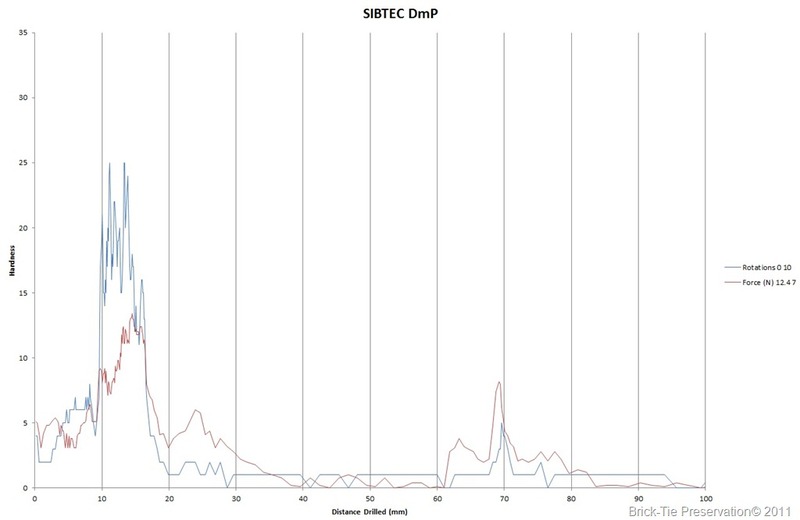 I took 145 measurements using the Sib Tec Dmp, all imported into Microsoft excel. I’ve included three simple plots from the job here: One is clearly from a sound piece of timber. A further plot indicates severe decay behind a sound surface. A third plot is sound timber too, however the probe is passing tangentially, through the growth rings at an angle. The actual strength looks low. This is not indicative of the strength of the timber as a whole. Timber’s superb tensile strength is gained from the cellulose chains and cell wall arrangement along the grain – it’s almost like a natural glulam truss, with the composite being where the strength comes from. The apparently confusing data, is solely due to the variable nature of wood. A wonderful substance; strong, durable and sustainable. Bloody complex too. Look carefully and you can see the fluctuations as the probe passes through the softer spring growth and enters the summer growth. Understanding how wood grows and is converted to timber is essential for any user of this technology. 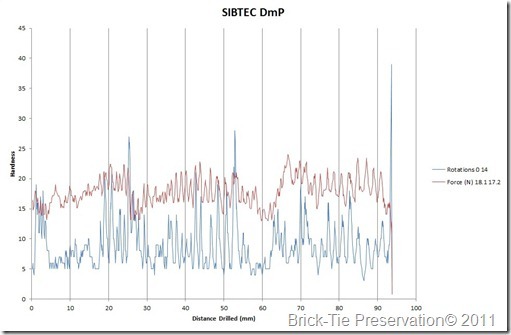 The Sib Tec Dmp is a wonderful piece of kit and was invaluable on this survey, finding decay below the apparently sound outer surface and allowing the client’s structural engineer to design a repair specifically for each truss; no guesswork needed. A little extra effort at the start of the project, which will help the contract proceed as planned, with no nasty surprises. Is the technology infallible? No. However, in the right hands it provides an extra layer of information and that is always good. If the occasional probe record is ambiguous, it will merely require further confirmation. It will never result in decayed timber being labelled as sound; though, soft sapwood, probed tangentially, may look too soft for comfort on occasion – further investigation will either confirm there’s a problem – or offer a pleasant surprise…not an expensive shock. Where a screwdriver isn’t enough – I’d never be without it. My thanks go to Michael White of Sibert technology, who is the brains behind this remarkable machine. Great blog as usual Brian. Good luck with this fantastic bit of Kit. Can I come out on site with you and see it in action – I can offer you free labour and even a sandwich lunch! You’re welcome anytime. I’ll be in touch so you can have a play with it…..
Really interesting article – thanks very much, but I’m not sure I’ve really understood the graphs (I’m probably being a bit dim! ): I’ve got the gist, but would’ve like a bit of labelling or more explanation there. Nice one Brian. Very interseting. Sound like and looks like a very interseting bit of kit. What do you charge for such a survey because i`m assuming its quite time consuming on site and the relavant paperwork and report? Thanks for the info the other day. I was a disapointed that it dident turn out to be a job that could use this kit, but I will keep it in mind for a later date. Nice one and good luck with it.